Home / News / America / Argentinian “Gladiators” qualify for Rio 2016! Argentinian “Gladiators” qualify for Rio 2016! 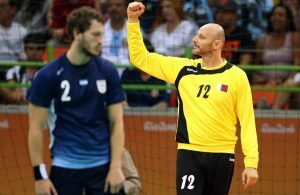 Handball is now the big story in Argentina! One of the most famous sports nations will have two handball team at Olympic Games in Rio 2016! Argentinian girls did that a day before their male colleagues, who beat Uruguay 20:12 (7:7) in the decisive semifinal match of the Pan American Games in Toronto. The place in the final was enough to reach the Olympic VISA for brothers Simonet and Co. as Brazil, which will host the Olympic Games will play against them in the final. Brazilian guys easily past Chile 34:24. Same teams will play in the female final later today. ← Previous Story NEW BIG NAME IN HANDBALL – Greek Olympiakos? Qatar to knock-out stage – Argentina scores two goals for 30 minutes! RIO 2016: TOP 10 handball girls to watch at Olympic Games! Argentinian roster ready for Rio!